Environmentally Friendly Landscaping | Envirobond Products Corp.
Over the last decade people have been more and more aware of his or her environmental footprint. Many of us try to include various green habits into our daily lives. Did you know there are many environmentally friendly landscaping practices you can easily use? You may already be using greenery and other aesthetically pleasing features. But there can be environmentally harmful practices that are needed to maintain some of these features. These can include unnecessary water usage, pesticide use, extensive use of mechanical equipment, and overall waste generation. There are many things you can replace with healthy practices to keep your yard beautiful with environmentally friendly landscaping. Plants native to your region are more likely to survive in the weather conditions where you live. They will require less maintenance, resulting in an easier gardening routine and a reduction in the use of natural resources. To master gardeners and landscapers, compost is fertilizing gold. Not only is it good for the environment but it is also great for your plants! It improves the fertility of your soil and has a lot of nutrients that make your garden healthier. There are several ways that environmentally friendly landscaping techniques can help use less energy for heating and cooling. Deciduous trees are able to save you energy in the summer by shading your house. They also cool the air when water evaporates from the trees’ leaves. Evergreen trees are good for slowing down cold winds directed at your home in the winter. If you choose to plant trees for these purposes remember that location is everything. Rainwater irrigation is a highly effective way to reduce water usage. It also saves you time. Rainwater is healthier for your plants as it does not contain salt or chlorine which dehydrates your garden. By putting your rainfall runoff to good use you will be able to save time and money, all while helping the environment. We know that chemical pesticides and herbicides are harmful to the environment. But they are harmful to people as well. Especially dangerous to pets and children, chemicals are not necessary to remove infestations. Organic methods are just as effective for environmentally friendly landscaping. A smaller lawn does not mean a smaller yard. 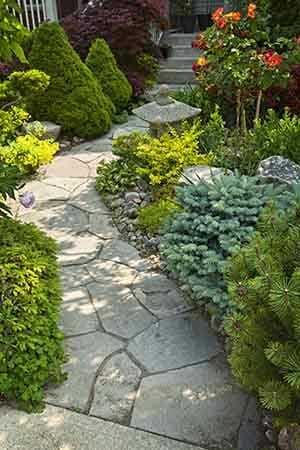 You can include flowerbeds, paved patios, shrubbery, or rock gardens into your plan. As a result of reducing the amount of grass, you can decrease your water usage by a substantial amount. EnviroSAND and EnviroSTONE are designed for the joints between paving stones and flagstones. The products are made of 100% naturally occurring materials. EnviroSAND and EnviroSTONE don’t use chemicals. Instead, they are made from a plant glue that resists washouts and nuisance weed growth. All of these tips for environmentally friendly landscaping can actually save you time and money. This means it literally pays to have an environmentally friendly yard. While all the tips listed above are helpful to the environment, they are beneficial to humans too! By doing these things you are decreasing your environmental footprint. And you are also providing a safer and healthier environment for you and your family as well.